What Happens When Ice Is Added to Hot Water and How Will the Energy Change? 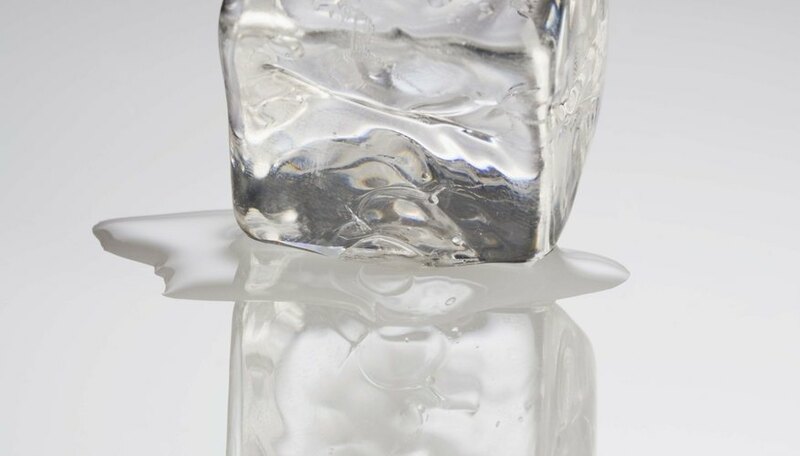 When you add ice to hot water, some of the water’s heat melts the ice. The remaining heat warms the ice-cold water but cools the hot water in the process. You can calculate the mixture’s final temperature if you know how much hot water you started with, along with its temperature and how much ice you added. Two physical properties -- the specific heat and the heat of fusion -- determine exactly how the ice melts and the water cools. A substance’s specific heat measures how much energy it takes to raise its temperature. For example, when you add 1 calorie of heat to 1 gram of water, it warms by 1 degree Celsius (1.8 degrees Fahrenheit). The opposite is true when water cools off; a gram of water that drops 1 degree Celsius loses 1 calorie of heat energy. Other substances have different specific heats. For instance, it takes only 0.03 calories to heat a gram of lead by 1 degree Celsius. A container of water loses 1 calorie for every degree Celsius it cools. However, when it reaches zero degrees Celsius (32 degrees Fahrenheit), the situation changes -- water turns to ice. This process involves much more heat energy -- 79.7 calories per gram -- and the temperature of the water-ice mixture does not change until it all freezes solid. When a substance goes through this phase, the energy is called the heat of fusion. Water molecules lose extra energy as they clump into a solid. Once ice has formed, it changes temperature according to its own specific heat -- 0.49 calories per degree Celsius. To determine exactly how the energy changes when you add ice to hot water, you need the mass of the ice and water as well as the water’s temperature. For example, because of its specific heat value, one liter of hot water at 75 degrees Celsius (167 degrees Fahrenheit) has 75,000 calories of energy more than the same amount of water at 0 degrees Celsius (32 degrees Fahrenheit). Adding 100 grams of ice to the water takes 7,970 calories to melt it; the available energy becomes 67,030 calories. Once it becomes water, the 100 grams takes 1 calorie per degree from the remaining heat in the hot water, but the heat isn’t “lost” -- it has simply moved into the cold water. As the hot water loses 7,970 calories to melt the ice, the water cools from 75 to 67 degrees Celsius (153 degrees Fahrenheit). The hot water loses heat, while the cold water from the melted ice gains heat. In this example, only 100 grams of ice are added to 1,000 grams of water. Therefore, the hot water loses a small amount of temperature, whereas the cold water warms up by a greater number of degrees. Dividing 67,030 available calories by 1,100 total grams of water gives a final temperature of about 61 degrees Celsius (142 degrees Fahrenheit). The hot water loses a total of 14 degrees Celsius (57 degrees Fahrenheit), and the cold water gains 61 degrees Celsius. Note that the results depend on how much ice and hot water you have at the start. If you add a ton of ice to 1,000 grams of water, the hot water won’t have enough heat to melt all the ice. Papiewski, John. "What Happens When Ice Is Added to Hot Water and How Will the Energy Change?" Sciencing, https://sciencing.com/happens-ice-added-hot-water-energy-change-23832.html. 24 April 2017.